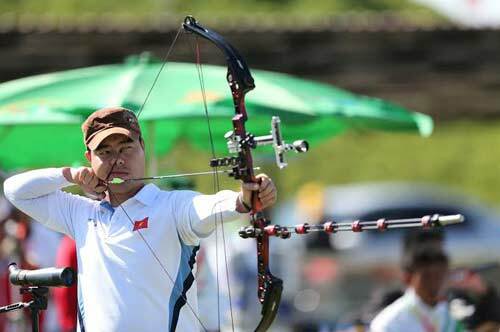 HA NOI — Two new national records were broken at ongoing National Top Archers Tournament at the Ha Noi-based National Sports Training Centre. Hanoian Nguyen Tien Cuong broke his own old record of 701 points in the men's three-stringed bow or compound event with a new score of 703 points. Both the silver and the bronze medals went to Cuong's teammates Nguyen Thanh Tuan and Mai Xuan Duc, respectively, with the same 679 points. In the men's recurve (one-stringed bow), five archers broke the national record of 639 points set by Hanoian Chu Anh Duc at the recent National Cup. With the highest points of 661, Nguyen Thanh Binh of HCM City took the gold medal. The silver medal went to Chu Duc Anh with 659 points, while Hanoian Nguyen Van Duy bagged the bronze with 653 points. Two other archers who also broke Duc's record were Tran Van Cho of Can Tho with 647 points and Nguyen Hoang Phi Vu of Hai Duong with 643 points. After three days of competition, Ha Noi topped the medals table with eight gold, 11 silver and 14 bronze medals, followed by Tra Vinh with four gold, two silver and one bronze medal.